Chateau / Country House968 sq. ft. The photographs and description do not do this property any justice.OK, so Pedona is a little remote, but the peace and tranquillity you get is worth very Euro and as for the views both daytime and at night, simply breathtaking.Sara is a most welcoming host and greeted us with warm friendly smile, as well as a fridge and cupboards stocked with enough food for an evening meal and breakfast for the 3 of us. The cottage is over 3 floors with the kitchen and shower/wc on the ground floor; a large double with wall to wall wardrobes and a smaller double bedrooms on the second floor; finishing with a large double with wall to wall wardrobe and ensuite bathroom on the third floor. All the bedrooms had a remote control ceiling fan.Everything else was provide, and included in the price, bedding, towels, crockery etc, etc.We drove, which is a must for this location and easily able to visit Pisa (45 min), Florence (1hr 15, use the park and ride at Villa Costanza just off the A1 south towards Rome, cost 3E return on the tram (22 min) which takes you into the heart of the city, plus parking), Siena (2hrs15), Lucca (40 min) and the lovely marina at Lerici (50 min). There is a great restaurant in Pedona, il Soggiorno, where we ate every night (except Tuesday, when it's closed) which also doubles as a small, but well stocked minimart. We had a fantastic holiday here and would like to thank Sara for allowing us to use the family cottage. Bello e mille grazie! Clean spacious house very well located with friendly owner Sara! 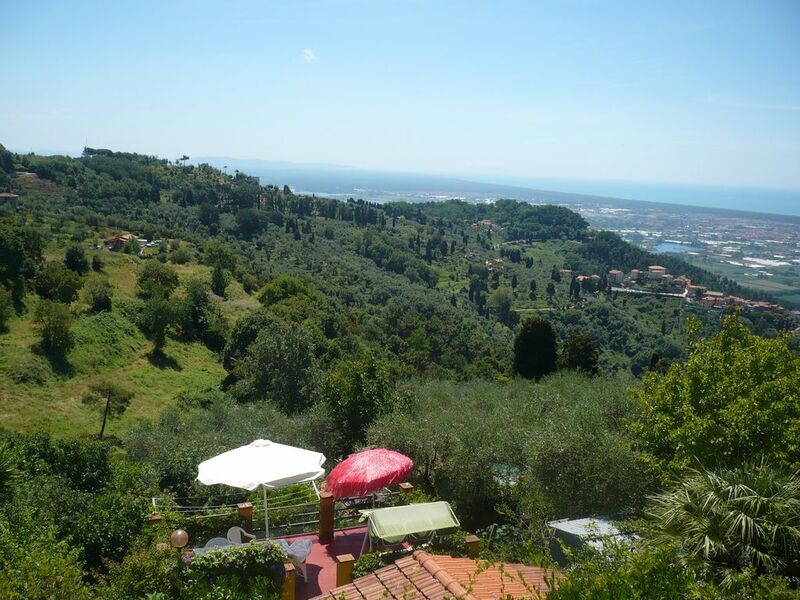 We loved our stay in Camaiore! The house is located in a small quiet Italian village on top of a mountain. The road to get there is quite fun to drive (very narrow, many curves), but might be scary at first for Canadians like us who are not used to it! During our stay, we visited Pisa (less than half an hour from the house! ), Viareggio, Lido di Camaiore, San Gimignano, Lucca, Montelpulciano, Voltera, Pistoia,and other towns. The house is also close to Florence, Sienna, and many other great cities and villages. You'll definitely have to set priorities if you spend one week because they're are too many places to visit (add vineyards to that list!). Beaches (Viareggio and Lido di Camaiore) are very close and very nice beaches (fine sand, warm water), but be aware that you'll have to pay (20 Euros for the day) to get a spot, an ombrella and two chairs (which is annoying for us, but that's the way it works there). Don't go to the public beach which is about 10m wide and very crowded. Get there early and spend the 20 Euros! The house is spacious with 3 bedrooms and 2 bathrooms. The kitchen, dinning room, living room are actually all in one room. It is not problematic, but it is not the best if you plan on spending family time watching tv (which you probably won't have time to do anyway because there are so many other things to do in Italy!). The terrace is nice with an incredible view of Lido di Camaiore (check the wheel at night which is all lighted up). We spent evenings there playing cards and drinking good Italian wine. The washing machine is very useful, but you cannot load a lot and cycles take 2 hours! The house is equipped adequately, but minimally. There is a parking close to the house. Make sure you don't park in one of the resident's spot (like we did!). Main positive comment is Sara. She is incredibly nice and helpful! It is fantastic to have the owner very close when you have questions. She gave us food when we arrived and she even entered our clothes that were drying outside when it started raining (while we were away). She is super friendly and speaks very well english. Note that other residents in the village do not speak English, which is great because you really feel like you're in Italy (as opposed to big cities where you feel like a tourist). Learning a little bit of Italian might make your stay more pleasant as many people in stores and restaurant don't speak English (learn the basic sentences!). Thanks a lot for the review, i'm doing my best for my guest. I'm sorry for the litte drawback of the private parking. on est accueilli par un grand sourire chaleureux dans un cadre magnifique! la maison est bien équipée et les petits déjeuners sur la terrasse sont de vrais moments de plaisir! quelques mets et boissons sont dans le frigo à notre arrivée: il n'y avait plus qu'à profiter...merci Sara! Perfect away-from-it-all house with amazing views. Tricky to get to but well worth it. The views from every window and the patio/garden are fantastic looking across open countryside to the coast. Sara had left a fridge stocked with food for us to start our stay, including cold beers! We spent much of our time on the patio just relaxing. The shop in Pedona has all you need and is just a 10 minute walk. If you drive down to Camaiore at the bottom of the hill there are lots of cafes and restaurants plus a well-stocked supermarket. I'm happy that you liked my place.. Yes is a peacefull pace ! Thank you so much for this testimony. The pictures do not do enough justice to this fantastic property. It is very spacious with a lovely garden / terrace. I would recommend the place to anyone who wants a peaceful break in a spacious property with stunning views. (Text automatically translated) The nearest restaurant is located in the center of the village, with typical regional cuisine and a delicious pizza to dine-in or take also from away.Posside also free internet access. The house is also close to the most famous cities of art (with their festivals and music festivals) as: Camaiore Lido di Camaiore, Viareggio, Pietrasanta, Florence, Lucca, Pisa, Siena.